"Dr. Markway, doing research to prove the existence of ghosts, investigates Hill House, a large, eerie mansion with a lurid history of violent death and insanity." Based on the novel, "The Haunting of Hill House" by Shirley Jackson, this Robert Wise film is still the quintessential ghost story. With its atmospheric black and white cinematography, it has all the elements you need to make a ghostie film scary apart from one thing - there are no onscreen ghosts! Everything is done with camera angles and noises plus a lot of tension. I first heard about "The Haunting" when the horror author James Herbert gave it as his favourite movie during a BBC documentary in the early '90s. It had never been shown on television, wasn't available on video cassette, and had pretty much been forgotten about. Suffice it to say that the demand for the movie increased enormously once James Herbert talked about it, but it was still a few years before it did finally appear on VHS in the UK. I'm not sure what year it was when I saw "The Haunting" for the first time but I would guess that it was close to the end of the '90s. I already knew what it was about by then, but I wasn't disappointed. I found it to be very character driven and got caught up in the story even though the dialogue was very dated and often embarrassing to listen to. The worst culprit was Russ Tamblyn's character who, as a former musical star of some kind, came across as a little bit too "hip" and didn't seem to be acting at all for most of his role. Nearly every word he spoke made me cringe. Maybe he was meant to since, in fairness, every character was intentionally a stereotype anyway. The four stereotypes presented, from sceptical professor to frustrated psychic spinster, have been used over and over in every "team investigates a haunted house" film ever since. With hindsight, that alone should have made "The Haunting" a classic. Their reactions to the various supernatural phenomena absolutely guaranteed it. There are very few movies which actually scare me and, unfortunately, "The Haunting" was more of a curiosity (like old "Twilight Zone" episodes) rather than something which I could truly call terrifying. I've tried watching it alone, in the dark, with the wind and rain rattling the windows, but I've never been able to conjure up the magic that must have been there for the original theatrical audiences. 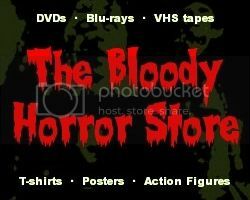 If you haven't seen a lot of horror movies, however, it may still work for you. I've recommended "The Haunting" before to people who have children who they want to initiate into the horror genre since it has nothing gory in it or anything too adult which would need a lot of embarrassing explanation. 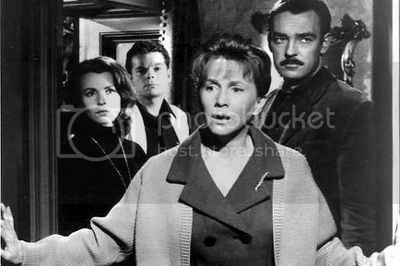 Apart from Claire Bloom's character, Theo, having very mildly hinted-at lesbian tendencies (which I'm still not entirely sure about), I would still say that "The Haunting" was suitable for all ages. There's nothing sexual, no swear words, no violence, no big scary monsters; in fact, it barely qualifies as a horror movie at all when compared to what we have today. If you find it scary, "The Haunting" may be all the proof that you'll ever need to win an argument that a horror movie doesn't need to have buckets of blood or people being tortured to have an emotional effect on you. "The Haunting" was a success because it was all about what you couldn't see. It's a shame that most of us no longer have the imagination to appreciate it.